CHCI could not do what we do for Tatu, Dar, and Loulis without the dedication, creativity, and energy of our interns. Interns help us out with pretty much every aspect of running the sanctuary. Clean and berm interns cook meals, clean enclosures, create enrichment, and collect and enter data. Chimpcare interns help with those tasks as well as serving meals to and providing social enrichment for the chimpanzees. Hydraulic operators do all of those tasks, and just about everything else it takes to run the sanctuary including moving doors for the chimpanzees and training and guiding the other caregivers. Rebecca assembles a food puzzle in the kitchen. 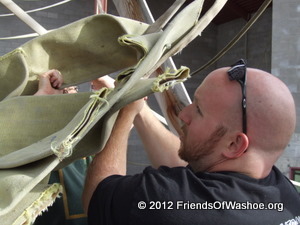 Austin repairs a cargo net. 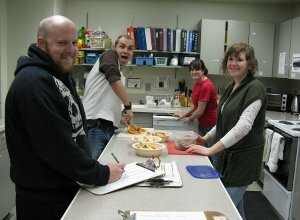 Austin, Alex, Kori and Susie handle the morning routine which includes preparing breakfast for the chimpanzees.